This support article illustrates how to start a chat group/thread. 1. While logged into your account, click on the "Chat" tab along the top of the page. 2. Click on the "New Chat" button on the left hand side, in the upper left. 3. You will be prompted to enter information about your participant. 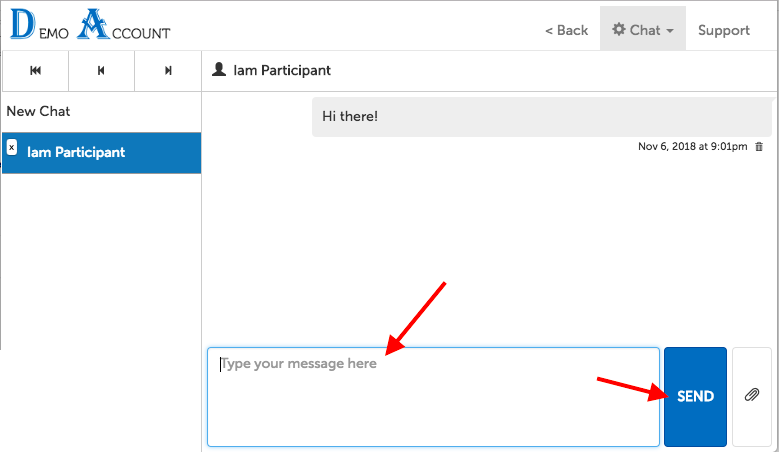 Chat With*: Required; enter the name of the participant (minimum of 2 characters). If you have saved this person in your Contacts list or they are a user in the organization that you have permission to access, their name should appear in the autofill once you begin typing. Otherwise, you can create a new contact. Mobile Phone: Enter a mobile phone number (United States or Canada) if your participant would prefer chat notifications by SMS. E-mail Address: Enter an e-mail address if your participant would prefer notifications by email. Participant Time Zone*: Required; choose the time zone your participant is in--this determines the time and date that will be used to display timestamps in their chat window (this defaults to the time zone on your account). Click "Save" to add this participant. Note: The chat message retention policy on your account will appear as a message underneath these fields. 4. 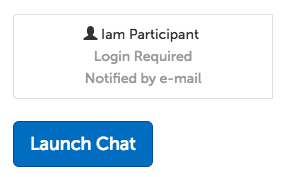 Click "Add Participant" to add another participant to the same chat conversation. 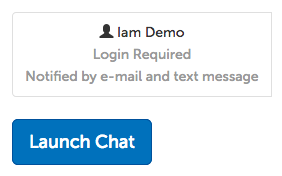 Or, click "Launch Chat" to be taken to the chat window. 5. 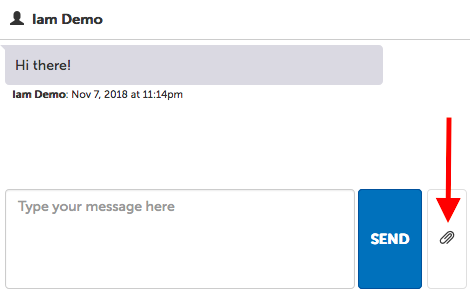 You can enter the first chat message into the textbox at the bottom of the page and click "Send". 1. 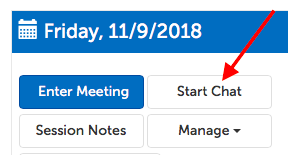 If you would like to create a chat group with the same participants as a current or upcoming video meeting, click on the "Start Chat" button on that session panel. 2. This will immediately create a group for you to enter a new message into. Type into the textbox at the bottom of the page and click "Send". 3. You will be prompted to enter your participant's name. Since your role does not have a host license, you can only chat with a participant that has an account within your organization. As you start typing, names that match in the organization will appear in the autofill. 4. Click "Launch Chat" to be taken to the chat window. Only users with a host license can create group chats. 1. If you received an invite by SMS invite, tap on the link in the text message. Or, if you received an invite by email, click on the link in the message. 1. Your host should have provided you, the session invitee, with a 9-digit Access Code for the session you want to join. Go to hub.securevideo.com/chat to enter it, and then click "Go" to be taken to the chat screen. 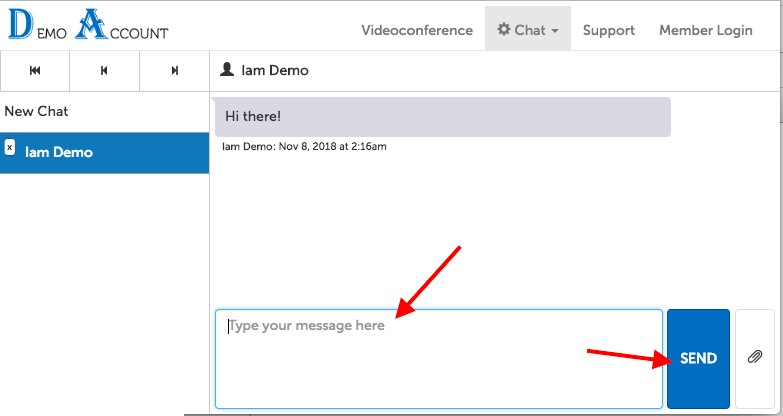 If you are the host, please see Clinical Chat: navigate and manage chat display for information on how to find this code. 2. 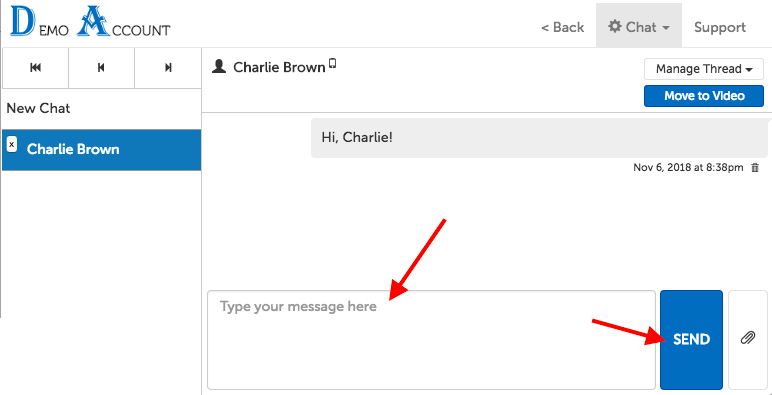 On the next page, type your reply into the textbox at the bottom of the page and click "Send". 1. Click on the "Chat" tab at the top of the page. 2b. If no chat opens directly, click on the "New Chat" button on the left hand side. 3. Start typing the name of a user that you have permission to contact. (This can be the name of the provider that displayed on the video waiting room page, or the name of another user you are aware of.) Click on the name in the autofill to select them. 4. 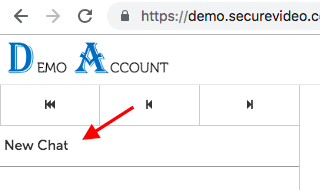 Click the "Save" button to add this user. 5. Click "Launch Chat" to be taken to the chat window. 6. On the next page, type your reply into the textbox at the bottom of the page and click "Send". 1. While logged into your account, click on the "Chat" tab at the top of the page. 2. Start typing the name of a user that you have permission to contact. Click on the name in the autofill to select them. 3. Click the "Save" button to add this user. 5. On the next page, type your reply into the textbox at the bottom of the page and click "Send".